Coupled with 30 min on treadmill at 6.3-6.7 mph. Tomorrow is a long run outside, as the weather is supposed to be gorgeous. Going to try for the half marathon distance to practice for the race which is in just over a month from now. As for my diet, I’m doing pretty well with my “no snack” policy after dinner so far this week, although it’s not easy! I have been making myself some hot chocolate as a ‘dessert’ instead which seems to help a bit. I either heat up a cup of my 45 cal /cup skim milk with 1 tbsp cocoa powder, and mix in some cinnamon and erythritol (no calorie/natural sugar) or stevia or I use a Swiss miss no sugar-added packet with water. It fills up my tummy and gives me a bit of that sweetness that I so crave late at night. I’ve been thinking a lot about why I have these cravings particularly at this time of day, as I am so good the rest of the day. I have no problem sticking with my breakfast, lunch, afternoon snack, and then… dinner time rolls around and I all of a sudden get all these urges. I brought it up to Pauline Nordin, my fitness mentor, during my consultation with her a few weeks ago and she asked me if I had asked myself if I really and truly wanted to give up these items badly enough. Am I willing to give up these ‘happy moments’ to get that shredded body? Food for thought, and something I definitely think about daily. I believe the answer is yes, I am willing to give up feeding my body those extra foods it doesn’t need. So every time I get tempted to reach for that piece of chocolate or extra protein bar or whatever it is that I have my mind on, I stop to reflect on just this thought. I never feel satisfied, content or happy after I have eaten these unnecessary items either, so why really put myself through that, why not learn from it? What I want more than these additional calories, is a lean body and that six pack – and I want to keep that condition for the rest of my life. If I want to achieve that, I need to eat clean, healthy and just enough but not too much. While I have to be strict about how many snacks I can have during the day, I am allowing myself to eat a very lavish dinner every night (within my calorie range of course and using lean proteins and lots of vegetables). 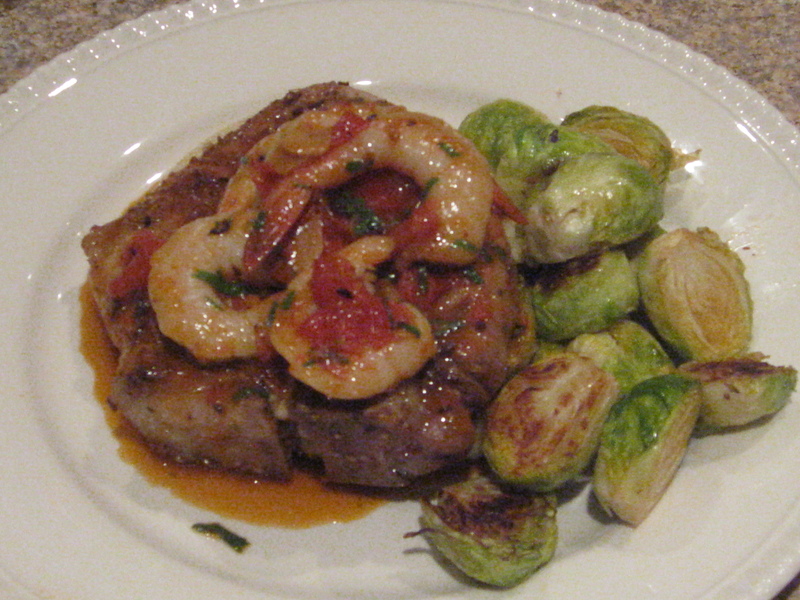 Here’s a photo of my dinner from last night – a juicy pork chop topped with a few grilled shrimp in a spicy tomato sauce, coupled with polenta (made with skim milk and shredded parmesan) and roasted brussel sprouts. Really scrumptious – and at just under 500 calories total!